Fans of Avenged Sevenfold are very familiar with the melodic acrobatics of lead guitarist Synyster Gates, and while most of his work is shredding on electrics, he is also just as capable of letting his fingers dance all over the fingerboard of a good acoustic, earning him a coveted placement on Guitar World’s Top 100 Guitarists Of All Time. The Synyster Gates 3701 from Schecter was built to handle the kind of playing style he’s made famous over the band’s illustrious career, but most notably on stripped down numbers like “Dear God” and “So Far Away”. 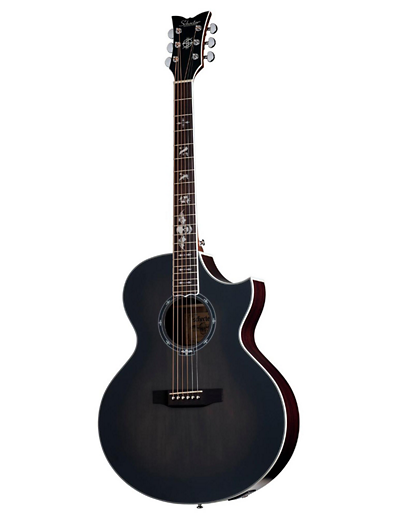 The Grand Auditorium has a generous cutaway paired with a thin C neck profile that allows easier access and smoother transition along the fingerboard ebony. 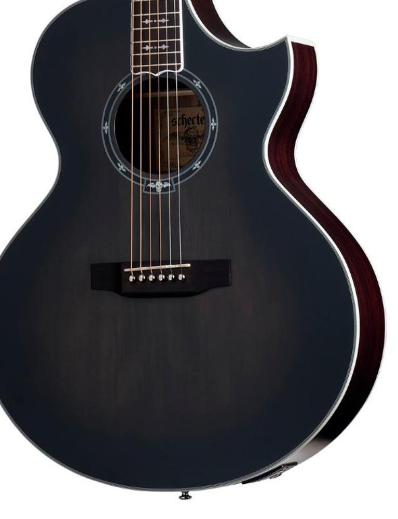 The dark, but inviting appointments include a solid spruce top with a transparent black burst finish and white multi-ply binding over a rosewood body, subtle double rosette, chrome tuners and pearloid fingerboard inlays, which include gothic crosses, the Avenged Sevenfold Deathbat and “SYN”. 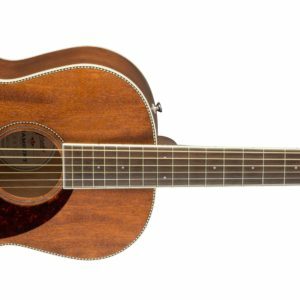 While it’s got a great acoustic tone on its own, the 3701 is also ready to kick it up a notch when you want to plug in. The onboard Fishman ISYS+ preamp and Fishman Sonicore pickup offer up volume, bass, and treble controls as well a phase switch and tuner.